Working-class girl, Miranda, suspects something is very strange about her elite new school. Things spiral into a nightmare when her obsession with old photographs puts her at odds with deceivers from another world. He convinces her the world is not what it seems. Deceptive creatures control the school and most of the earth. 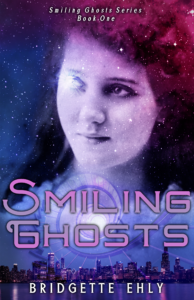 For an amazing adventure of love and courage (with a villain you’ll love to hate) buy Smiling Ghosts now! Mysterious Blue Orb/UFO up close! If you have a weird thought, idea or image, this is the place to share it! Nothing is too silly or strange for Weird Wall. You are welcome to comment about any post or tell us about a similar experience you had. Maybe you saw or heard something amazing, too! People who love WEIRD are special people. Let’s support each other as we share ideas about this amazing universe. I love reading fantasy and sci-fi, so I’m excited about this site. I haven’t had any really weird things happen to me yet, but there is still time. Excellent Fiction © 2019. All Rights Reserved.